Meet Puneet Sandhu. The fun, easy going, and charismatic family and cosmetic dentist in the heart of Scottsdale, Arizona. Dr. Sandhu’s passionate and professional approach to his practice creates a great atmosphere and he and his team generate a level of confidence that his patients trust and love. Being driven to connect with the patients, to maintain that interaction, and to personalize each experience are some of the main aspects of what make Dr. Sandhu enjoy his practice. “Patients not only have a voice, but they are a partner in helping themselves achieve improved dental health” says Dr. Sandhu. Growing up, the doctor has always been this driven. Born in upstate New York and growing up in Cincinnati, Ohio Dr. Sandhu believed that outlining and knowing the steps it would take to achieve one’s goals would be the driving force for success. This philosophy he had continued to play an essential role in his life. From varsity football star to finishing his undergrad in 3 years at the University of Arizona in physiology and minor in chemistry, Puneet wasn’t quite finished. He then continued his education by going to UCLA for dental school where he would find his spark. His passion for the genre landed him as a faculty member of SPEAR education, the largest dental education company in the world where he would be part of a study group to learn the art of comprehensive dental care. He is also a proud member of the Fellowship International Dental Implant Association, The American and Arizona Dental Association, and the Central Arizona Dental Society. Within this field, he found his niche in full mouth reconstruction. “For people to have the opportunity to reconstruct their mouths; Medically their teeth and gums as well as their overall health is increased dramatically allowing them to feel better and are happier than ever” Says Dr. Sandhu. 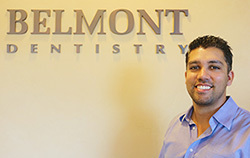 Fast forward to the present moment, Puneet is proudly able to represent Belmont Dentistry as his prime sanctuary for doing what he loves. The drive he has can provide him with being with his fun-loving wife and kids where he can also kick back and watch some Cardinals or Giants football games too! But it’s the hunger to continuously grow as a family man and a leader are what make him so unique and he makes sure to bring that to his practice. Dr. Sandhu welcomes you to Belmont with open arms and incredible compassion. Enjoy your visit and get to known the success behind the great establishment.